Speaking confidently and appropriately in work and social situations is a major skill for everyone to master. 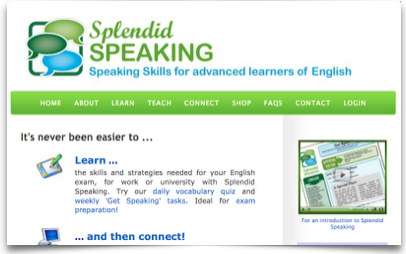 The Splendid Speaking website teaches learners of English how to shine at job interviews, how to give memorable presentations, and many other key communication strategies. The website makes extensive use of podcasts featuring interviews with and presentations by advanced learners of English with feedback from Peter Travis. This website is particularly suited to undergraduates and workers in the business, retail and service sectors. In 2007 Splendid Speaking was shortlisted for the British Council ELTON Award. During busy periods over 40,000 sessions are recorded by nearly 30,000 visitors. The website also has a supporting Facebook Page with a following of 16,000 students and teachers. The Splendid Speaking strategies are a remarkable opportunity to get more fluent and confident in English. Thanks to Pete and Fiona for creating so splendid way of learning Speaking skills. I really believe that a good speaker is made and not born, so the tips Splendid Speaking provides are really helpful. Cracking use of technology, but seamlessly done. The learner just sees (or hears!) the lesson. This is truly embedded technology, absolutely brilliant.